Exicor® systems measure the optics used in the world's most sophisticated optical equipment, optical lithography systems. These systems demand the most stringent low-level retardation measurements, which Exicor provides repeatably and accurately. Calcium Fluoride and Fused Silica for optics are grown in cylindrical boules. The material is cut into cylinders 200-300mm in diameter. Following satisfactory birefringence measurement, these pieces may be formed into lenses. Many of the lithography systems in use today are polarization-dependent. Light passes through these systems at a particular polarization state. Any birefringence in the lens train could change the polarization state of the light, reducing intensity in an area where a polarizer is set to accept the expected polarization state. The change in intensity could mean that portions of the chip are not imaging correctly, which would adversely affect yield. In this application, samples with a birefringence measurement value approaching zero are preferable. 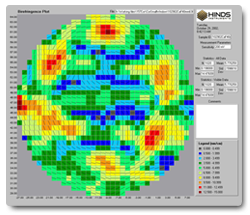 →Exicor's unsurpassed sensitivity insures repeatable low-level measurements. →Customers requiring multiple instruments in different facilities can count on measurement accuracy and repeatabliity from instrument to instrument. →Exicor provides the most precise measurement available at a faster speed than any competitor. 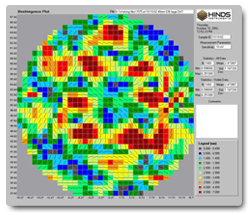 Contact us for more information on Hinds' Exicor systems used in lens and lens blank characterization for optical lithography.